Marcia drove the 112 miles southeast to the Capitol of Aragon, Zaragoza (thairrr-ah-go-thah). This is the city Dr. Hoyos went to medical school in and where his wife Maite is from; one of the reasons I wanted to see it. Many people told us there isn't much to see in this city of 600,000 people and we could skip it but am I glad we didn't. It is one of the nicest cities in Spain as I will explain. It took 2 hours to get there and we checked into the Hotel Meliá Zaragoza on Avd CaesarAugusto at 5:45. The name Zaragoza comes from a corruption of its original Roman name Caesar Agusto. Say it fast a couple of times (with a lisp). We parked in the garage downstairs and after unpacking, I went down to the desk to find out about Internet and closing times for places we wanted to see. Some pretty tour girls were nearby and they told me that the Aljafería Palacio (I wanted to see and thought was miles out of town) was quite near in the city and open until 7 PM. The desk told me that there was an internet joint around the block at the back of the hotel so I ran over quick and went inside. What a place. There must have been 40 computers packed into this tiny place and there was a teenager on each one playing some video game and they were yelling and hooting. I asked the kid if I could get online and thankfully he took me to the back with one open computer. I got on quickly and it is worked like a zip sending out Chapter 44. I signed off and tried to find the same kid to pay him and there didn't seem to be anyone in authority in this zoo so I just took off figuring I would be back later or tomorrow and pay somebody. I dashed back to the hotel room so we could get to the Palacio in time but Marcia had other plans. We caught a cab and it didn't take too long to get there. It looked beautiful in the late evening and even better when we left with all the lights on it. The Palacio de la Aljafería was originally built by the Moors in the 800’s and after the Reconquest, Fernando y Isabel couldn't resist using it for a palace. The musallah (an intimate mosque) on the first floor was astounding and beautifully preserved. It looked as good if not better than the Alhambra in Granada and the Mesquite in Cordoba. As it turned out they didn't close until 8 PM so we got to see the whole place and it was all lit up beautifully when we left. We walked for a little while and then caught a cab and took the 2 mile ride to the Plaza del Nuestra Senora El Pilar in the center of the old city. This long name comes from “Our Lady of the Pillar” and this is the second greatest pilgrimage site in Spain alter Santiago de Compostela. The story goes that Mary gave St. James (or vice versa) this pillar to build a basilica in Zaragoza. A statue of the Virgin sits atop the pillar and the mantra (small cloth covering) is changed everyday. Now, as a Catholic, I have a hard time with this one also, but, to be fair, maybe I didn't get the whole store straight because I was very impressed by the devotion of the people to this pillar. The Plaza is very large and flanked on two ends by the Basilica Pilar and the Catedral de Seo al Salvador. In between them are the Ayuntamiento (remember, City Hall) and the Lonja building. Near the Catedral is an erected covering for the excavations of the Roman Forum and Marketplace that was found underground during excavation several years ago. There was a line in front of the Lonja entrance, so we queued up (habit from our UK trip). The exhibit they had inside was free and was about art and expression regarding the unionism movement and the poor and downtrodden. We saw many excellent paintings and even a model of the human eye dating back to the 1700’s. They were watching me like a hawk so I only got some video not good enough for photos. We were there for a half hour and when we got outside we walked to the front of the Basilica to see what this large greenish pyramid was. I asked a Spaniard who told me (in Spanish) that last week was the Feast of Nuestra Senora El Pilar and they build this pyramid of flowers for the festa. We went inside the basilica and I was floored by the difference in this church from all the others we have visited in Spain, Italy and the UK. All the huge original doors were wide open and anyone could go in or out any of them. The place was crawling with people walking around, praying, and visiting devotional chapels. It was like this church really meant something to the people and it was a big part of their lives. This was serious and quite different from what I have seen anywhere else. I gravitated to a central chapel covered in beautiful marble and after a few minutes my eyes focused in on why all the people were there; I saw the Virgin statue on the pillar. When I zoomed the camera in, I could not see any mantra on the statue so maybe it is taken off during the feast days. It is a major thing to go behind the chapel where there is a small opening where you kiss the back of the pillar. I waited in line with the rest and touched it. I walked the rest of this beautiful church and saw the altar piece and the large interior domes. It was a very comfortable place to visit and we were in no hurry. They had a Mass at 9 PM so I caught the last half of it while Marcia enjoyed a rioja at Bar Santiago in the Plaza and then I joined her for one. Around the corner we found the main pedestrian street (similar to the Santa Monica Promenade) that had just been finished and opened up last month. It was very nice with brand new street lamps, etc and a lively crowd. About a block up we wandered into Flanagan's Pub because it had a big Guinness sign outside. Alter a Guinness and rioja we decided maybe we would try the “Mexican Menu” they had and ordered cheese nachos, pollo wraps, potato with quesa and chili con carni as well as pollo alitas (chicken wings). 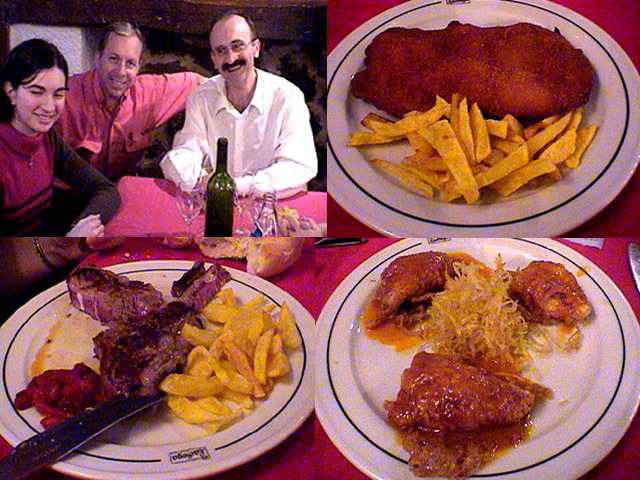 It was all pretty good and a change from the typical Spanish fare we had been eating. The whole thing cost 5200 pesetas ($25). Alter dinner we walked the “promenade” just as we do at home and then had Irish coffees at Gran Bar Zaragoza, a pretty neat place that seemed like the 1880’s. From there we walked to the Roman wall and then caught a cab back to the hotel. Marcia went to bed while I took the computer to the bar and had a cappuccino and did some photos. I got to bed at 3:30 AM. Waking at 9 AM, I went for my run at 10:50 and ran to cross the Puente Santiago (bridge) across the great Rio Ebro and then took photos on the way back and into the Plaza Pilar. I changed in one of the cafes in the square. I went into the edifice created above the ruins and excavations of the Roman Forum and Market that is below the Plaza. I asked the entrance man what the hours were and he said it would be open after I went to Mass at the Seo Catedral. I took one of their brochures about the Roman Forum and read it in a cafe nearby while having a cappuccino. There were so many spelling and grammatical errors in the piece, the editor in me came out and I made all the corrections necessary and put it in my pocket. I went to the Seo Catedral for Mass at 12:30 and the place was also very nice. Again, no video/photos signs all over. From there I went back to the Roman Forum and the same guy tells me to enter now is "no possible.” I didn't settle for this and kept asking him why he told me I could come back. Finally a Spanish family nearby intervened and translated for me. They told me he said they can only SELL 60 tickets each day for visiting the ruins and all 60 had been sold. Alter pleading that I was leaving today and never coming back (which has never done me any good so far in Spain), the guy gives up and directs me to just go downstairs. Since I looked perplexed, the girl in the family tells me that he wants me to just go ahead (free, since he couldn't sell a 61st ticket). So I went down and explored the excellent renovations and museum they have set up. On the way out I gave him my edited copy of their brochure and he thanked me and said he would give it to the higher-ups. After taking photos of the buildings in Plaza Pilar in the daylight and the monument to Goya, buying some pins, and seeing the Roman walls and statue of Augustus Caesar, I caught a cab back to the hotel. The driver stopped and let me take photos of Plaza Español. It was now 2 PM, so we packed and checked out of the hotel, got the car loaded in the garage and headed out of Aragon to return for the third time to Catalunya and Barcelona.